After the 2011 revolution Tunisia began a process to grapple with decades of repression and abuse, the consequences of which reverberate today. Women’s experiences and perspectives are essential for this process to truly generate social change in the country. However, sharing their stories publicly was not easy. For a long time, women’s voices were at risk of being lost. As the government sought to establish the truth about the country’s past, women in Tunisia did not feel comfortable discussing the violations they endured. The Truth and Dignity Commission (TDC), the government body established in 2014 to address abuses since 1955, created a women’s committee and carved out a significant place for women in its proceedings, but still struggled to represent voices equally: men accounted for 95% of its submissions as recently as 2015. Recognizing this imbalance, a group of 11 women’s organizations gathered to create the “Transitional Justice is also for Women” Network to ensure women’s testimonies were heard. ICTJ helped establish the Network and coordinated its efforts, and over the past two years has worked with its members as they identified the main challenges women face in Tunisia and amplified their experiences of the dictatorship. This work culminated on May 16, 2016, when the Network submitted a total of 140 testimonies to the TDC, marking the first time a women’s advocacy group presented a collective file to the commission. The Network’s historic submission was fueled by grassroots efforts. Besides shedding light on women’s roles and what they went through during the dark history of the dictatorship, the group offered practical suggestions to create an environment in which everyone felt comfortable testifying before the TDC, one that ensures that their experiences are included. Such measures included promises of confidentiality and the establishment of testimony-gathering sites closer to women’s homes. Furthermore, the Network sought to expose various violations against women, including sexual violence and abuses of their economic and social rights. ICTJ worked in partnership with these groups, discussing the TDC and its process with women. These discussions highlighted the barriers to their participation in the process and the role women’s associations could play to increase their visibility. In the course of this work, ICTJ identified several pervasive factors that led to the marginalization of female victims in Tunisia during the first working period of the TDC. These included: fear of social stigma; confusion as to the role of the TDC and its promises of confidentiality; and negative media influence. Women were also unaware of their status as indirect victims, and often did not consider their suffering to be a violation unless it included physical torture or political incarceration. With these factors in mind, ICTJ, alongside the Network, reached out to around 300 victims in 9 different regions of Tunisia. Outreach efforts focused on showing women from rural and other marginalized areas the potential impact of their testimony. Submitting a file was more than simply telling their story: their testimony was an opportunity for the nation to understand what happened, why it happened and how to act to avoid recurrence and thus protect the next generations of Tunisian women and girls. Discussions also focused on the remarkable discrepancy between what the state – which is considered a regional leader in women’s rights based on its laws – officially offers Tunisian women and the retrograde reality of its violations. One of the groups most targeted by the dictatorship was veiled women, who were deemed political opponents of the secularist government for simply wearing a veil, and were treated like second class citizens because of it. Perhaps no violation illustrates this better than Circular 108, which targeted veiled women and led to lost educational and professional opportunities. On September 1981, the regime of Habib Bourguiba enacted a circular that nominally aimed to regulate internal work within the public administration. This circular was quite particular, though, as it prohibited access of those wearing a “sectarian dress” (a reference to the veil, known as hijab) to government services. Repression was at its peak under the Ben Ali regime (1987-2011). The systematic application of this circular since 1981 affected women from different social, professional and educational backgrounds and age. While the circular was often reduced to Islamism vs. secularism, generations of Tunisian women and girls who had no relationship nor even interest in any kind of political ideology were victims of lost opportunities in terms of access to several kinds of basic rights only because they chose to wear the hijab. These economic and social violations occurred alongside rampant sexual violence against Tunisian women. However, few involved in the Network were willing to testify to their experiences with sexual violence, and so the network focused on the impact of Circular 108 as a way to give voice to women in the transitional process. It became clear that testimonies against Circular 108 could be a powerful tool in highlighting the suffering women endured. The Network held four preparatory meetings in Tunis, Sfax and Monastir, in order to discuss the submission content, the files to be submitted and related work. After those meetings, the Network selected 140 files which documented the long-term consequences women endured as a result of Circular 108. The selection process highlighted the link between the circular and the violation itself, and how this violation contributed to the denial of basic social and economic rights such as work and education. Alongside the presentation of their testimonies, the women who submitted the file are calling for the annulment of the discriminatory administrative order enacted in 1981, which still remains in place. They also demand proper redress, including a state apology, a public hearing at the TDC and material and symbolic reparations. What should also be taken into consideration in this kind of collective submission is the necessity to look beyond a narrow interpretation of Islamist vs. secular and see the human rights issues at its core. In a country that is paving the way for its institutions to be democratic, it is necessary that all Tunisian women citizens’ rights are respected –whether they are veiled or not. Just as veiled women should not have endured discrimination under Circular 108, so too must non-veiled women be protected against any future discrimination for their choices. We must take steps to guarantee those rights. Tunisia courageously chose to reveal the truth about its legacy of human rights abuses through the TDC and women have been one of the strongest forces pushing for justice, truth, and reparations since the 2011 revolution. While the work ahead is still huge, the TDC recognizes the importance of women’s perspective, and has actively included more female voices. Women now account for 23% of its submissions. 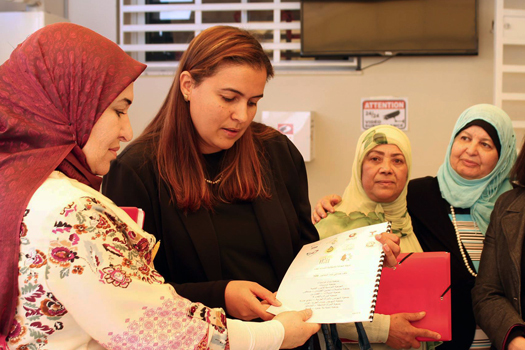 This inclusive work must continue, and the “Transitional Justice is Also for Women” Network’s submission brings the commission closer to its vision of an inclusive forum mapping Tunisia’s path forward.